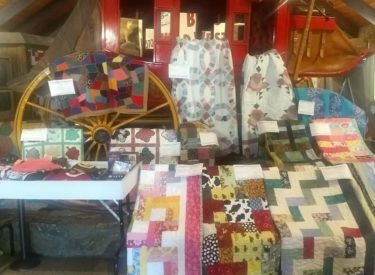 PAWNEE, Okla. — The Pawnee Bill Ranch and Museum is hosting its annual quilt show throughout October. The exhibit is open during normal hours of operation and there is no charge to see the special exhibit. The beautiful works of art on display include both heirloom quilts and modern quilts. Cimarron Valley Quilt Guild and Pawnee Bill Quilt Guild members are instrumental in putting together this yearly event. On Saturday, Oct. 20, the Pawnee Bill Ranch and Museum will host Fall in Love with Pawnee Bill Ranch, a fall festival full of activities for guests to enjoy from noon to 3 p.m. Come and enjoy blacksmithing demonstrations at the blacksmith shop, children’s crafts with refreshments at the museum, horse-drawn wagon rides at the big barn, a children’s pumpkin patch, photography stations, a hay maze, tractor-pulled hayrides through the exhibit pasture and many more activities. The Pawnee Bill Ranch and Museum is located at 1141 Pawnee Bill Road in Pawnee. Hours of operation are 1 to 4 p.m. Sunday and Monday, and 10 a.m. to 5 p.m. Tuesday through Saturday. The mansion is closed for stabilization work, but visitors are welcome to explore the other buildings on the grounds. Admission fees will be suspended while the mansion is closed.